1. Cook noodles according to directions on the package. (I didn’t add any noodle seasoning but you can if you want to) Drain the noodles and allow to cool to room temperature. 2. Whisk 1 egg into a bowl and add the noodles. Mix well to ensure that the noodles are coated with the egg. Divide the egg-dressed noodles in half and place each half into a ramekin or other round container. Cover the noodles with plastic wrap, and place a can of soup or heavy bowl on top to press it into shape. Refrigerate for at least 15 minutes. 3. Add oil to a pan and once the oil is hot, cook the noodle buns until each side is golden brown. 4. Cook the burger patty on a pan and once it’s cooked to your liking, place the cheese on top so that it melts onto it. 5. Fry 1 egg sunny side up. 6. Time to assemble the burger! The order I did this was: noodle bun, tomato sauce, burger patty (cheese side up), fried egg, beetroot, rocket and second noodle bun. A burger that looks terrific and tastes terrific! 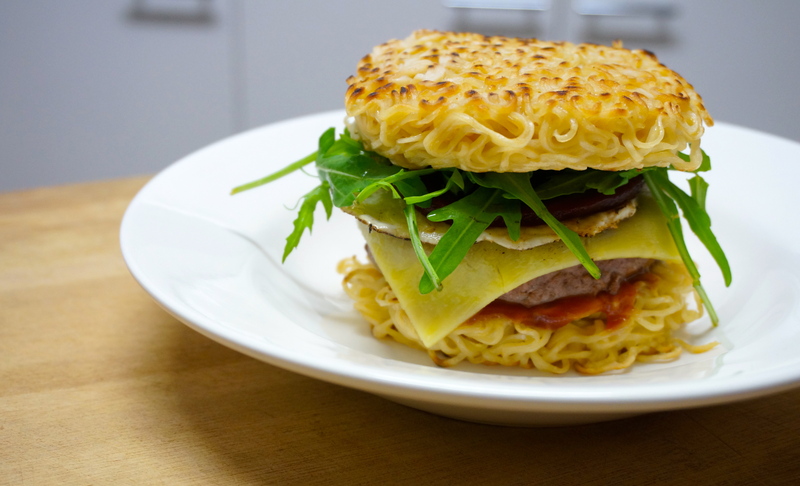 This looks like a great homemade take on the ramen burger trend!